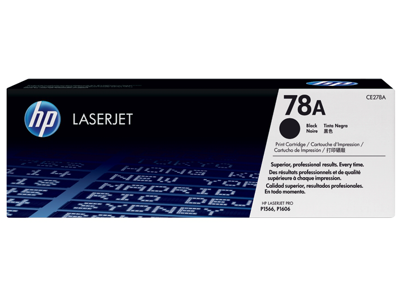 HP 78A Black original LaserJet toner cartridges offer great value for your everyday printing needs. The cartridge and laser printer optimize print quality and reliability for trouble-free, professional prints. HP toner cartridges are designed and tested with HP printers and built-in toner cartridge intelligence to produce smudge free, leak free, and defect free documents. For HP printer compatibility options, see the table below. Cartridge yield (approx. ): 2,100 pages. What's in the box: New Original HP 78A (CE278A) toner cartridge. The HP 78A original HP monochrome toner cartridge installs quickly and easily. HP 78A cartridges and laser printers are designed together to help optimize print quality and reliability for trouble-free, professional prints. Greener choice — contains 27% recycled content. For an even greater value, consider the HP 78A Black Original Toner Cartridge (CE278D) 2 Pack and save up to 10%. HP 78A (CE278A) toner cartridge works with: HP LaserJet Pro M1536dnf, P1606dn. Crisp text and line edges with precise toner placement. Enjoy professional print quality for bold, crisp text and sharp black-and-white images. Spherical black toner and HP toner cartridge technology provide precise toner placement every time you print.